Slip on work boots are just as effective as those with laces only they’re much easier to put on and take off. If you’re thinking about getting a pair, you’ve come to the right place. We researched the best slip on work boots and put together this buying guide to help you find the best pair for you. Before we get started, let’s take a look at some of the features you should know about when you shop. 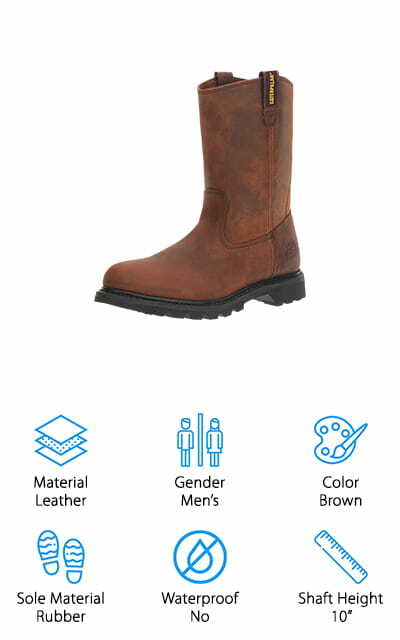 Material: Leather is one of the most durable materials for shoes available which is one reason why all of these work boots are made out of it. Color and texture vary slightly, though, so there’s still a lot of variety. 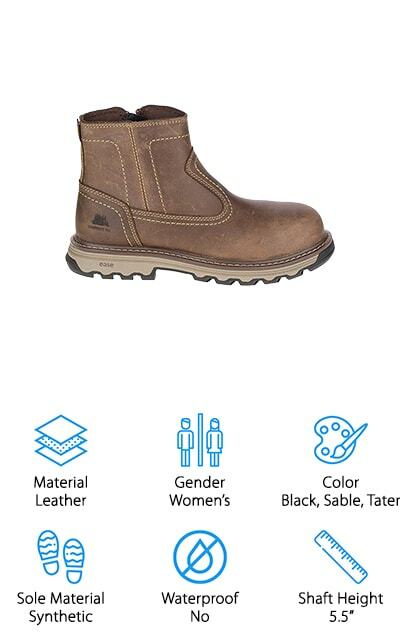 Gender: We found men’s boots, women’s boots, and even some that are designated as unisex. That said, there’s no reason not to choose whatever boot works best for you, regardless of gender. Just makes sure you get the appropriate size. Color: Colors vary slightly from one style to the next but they’re generally basic workplace or uniform friendly shades of black, brown, and greys. There are a few that offer a little more style with stitching and different accents. Sole Material: These boots have soles that are either rubber or a synthetic composite made to resemble rubber. It’s important that the sole is made of grippy material that can resist oily liquids. Bonus is it’s rated as electrical safe as well. Waterproof: Some of our picks are rated as waterproof, most are in water resistant. That means they’re fine in rain or wet conditions but won’t stay dry when submerged or exposed for long periods of time. Shaft Height: Because we know different workplaces have different requirements, we found a variety of different shaft heights. This list includes everything from ankle boots to boots that are mid-calf. There really is a little something for everyone. 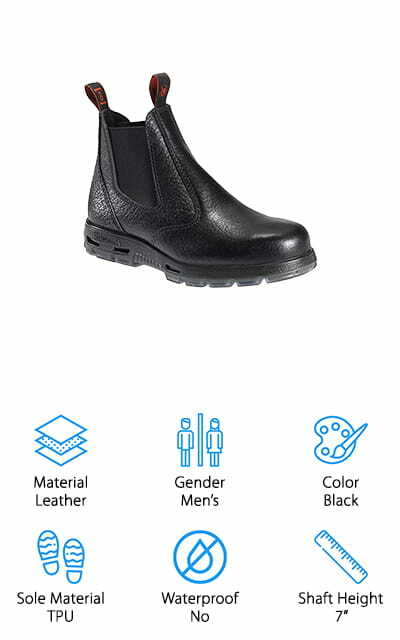 Now that you know a little bit more about the specific features to look for, let’s take a look at the next part of our slip-on work boots reviews, the top ten products. Here’s how it works. We put our top and budget picks at the top of the list so you can get a good look at them, even if you’re in a hurry. Stick around for all ten products if you can, there’s quite a variety here. Ok, let’s go! These top rated slip on work boots from Ariat are our top pick for a lot of reasons. The shaft has a flexible panel inside that allows enough stretch to pull them on easily without affecting the fit. There are pulls on either side of the shaft that give you a little more to grab onto when getting them off and on. These waterproof boots keep out rain and snow thanks to the full-grain leather upper and Goodyear welting. The EVA midsole offers a lot of support and the platform keeps your ankle stable and prevents fatigue during long periods of wear. That’s not all, the outsole is self-cleaning and non-tracking plus it’s oil and slip resistant for safety. They have a distressed, western look that’s available in 3 different color combinations. Next up is our budget pick, the best cheap slip-on work boots we found in our research. Stanley Dropper Work Boots are made of genuine leather and have comfortable, flexible rubber sole that’s slip, oil, and acid resistant. While these are great for any trade, they’re a perfect choice if you work around oils or any caustic liquid. Not only are the safe, they’re also exceptionally comfortable, too. You can wear them for long periods of time with minimal foot fatigue because they’re so lightweight. Plus, they have a removable insole that provides significant cushioning and support. They’re a great choice for large calves and has a hard time finding boots that have a high shaft and a good fit. They’re available in both black and brown and have a classic round toed style. The Revolver Boot from Caterpillar has a basic style with a round toe and clean design that has just a bit of a western feel. In fact, they’re stylish enough to wear when you’re not working in them, too. They’re made of leather and have dual pull-on loops so getting them on is quick and easy. These boots are great in most intense work environments. The rubber outsole is oil and slip resistant and has a pretty solid tread. 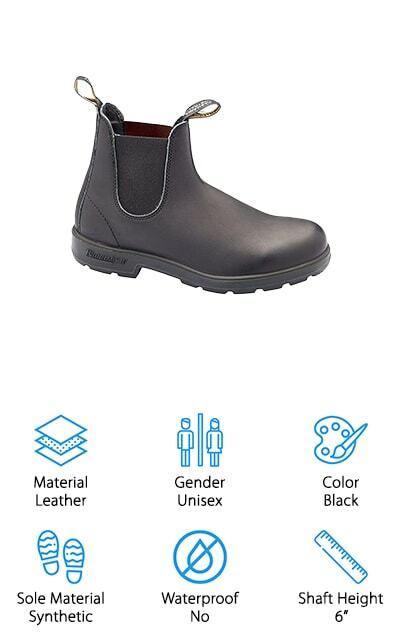 While these boots are not technically waterproof, they are water resistant so you don’t have to worry about your feet getting wet in normal conditions. They require a bit of a break in period but once the adjust for your feet, they’re comfortable. Plus, they’re really rugged and built to stand up to a lot of wear. If you’re looking for a great pair of steel toe work boots, you’re in luck. We found an awesome pair or Dr. Martens that you’re going to love. 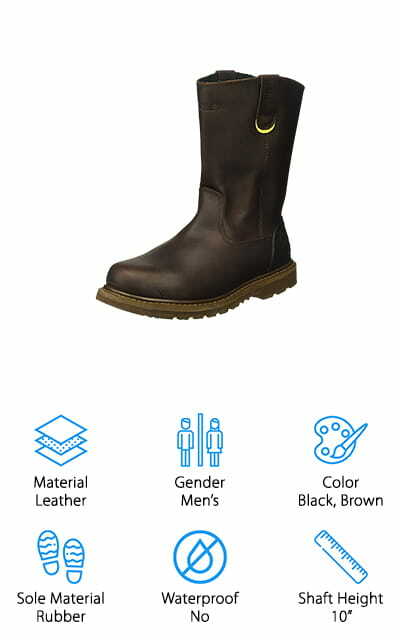 The Icon Steel Boot is crafted from strong, durable leather that provides a lot of protection and comfort. Dual pull tabs help you slip into them quickly and the reinforced stitching provides superior durability. The midsoles are soft and provide a lot of cushioning to keep your feet pain free even after a hard day at work. They also have a slip and oil resistant outsole that has enough grip to keep you safe on a variety of terrains. That’s not all, they’re even rated electrical-hazard resistant for shock protection. All that with the steel toe makes these a great choice for any demanding workplace or jobsite. They’re even OSHA approved. 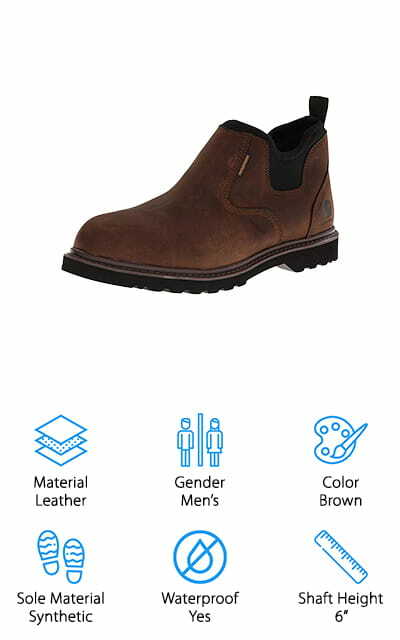 For professional work boots that have a lower shaft, we like the Blundstone 510 Slip-On Boot. The anatomical design is super comfortable and is fitted with a shock absorbing system that reduces it by 33%. What does that mean? Your feet won’t feel tired and worn out at the end of the day. The foot bed is removable so you can swap it out for an insert if needed but the moisture wicking feature provided by the original footbed keeps your feet dry and helps reduce odor. The leather upper is fused to the PU outsole for long-lasting durability. The outsole is also made of dual density layers for a softer, more comfortable impact. Front and back pull tabs and flexible panels help get you into and out of these boots quickly. They even include wax for waterproofing. 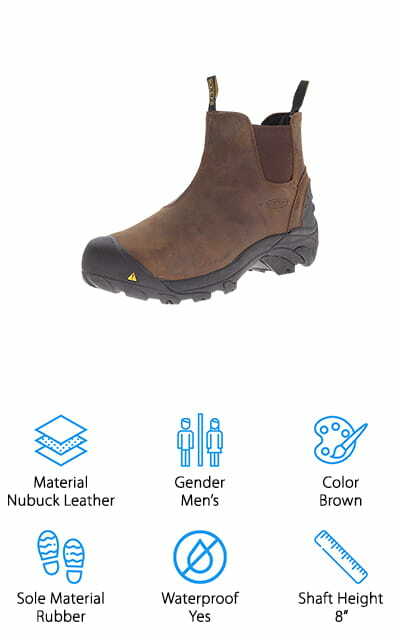 KEEN Utility Work Boots are comfortable slip on work boots that are rugged and comfortable. The rubber sole had great traction. It’s oil and slip resistant as well as non-marking. There’s even a shellback to add more grip and make them last even longer. They’re made of waterproof nubuck leather and have asymmetrical steel toes and provide significant protection even in strenuous work zones. We said they were comfortable and we meant it. The EVA midsole has dual density compression and is lined with quick drying, moisture wicking material that helps keep foot odor at bay. There’s also a torsional stability shank to add extra support and stability. Each side has an elastic gore panel and there are front and back pull tabs so they’re easy to put on and take off, too. The best slip-on work boots for sale that are also really stylish are the Carhartt Romeo Pull-On Boot. As you’ll see, they have a lot of great features that make them perfect for the job but they also look good enough to use as an everyday shoe. The sole is made of Goodyear welted brown leather and is rated for protection against electrical hazards. As for the uppers, they’re made of genuine leather that’s been oil tanned waterproofing. Inside, a waterproof, breathable membrane makes extra sure your feet stay dry. The inside is also fully lined with moisture wicking material to soak up sweat and help keep away odor. They’re comfortable, too. The ankle has a neoprene lining that provides support without any pressure and it’s stretchy so you can easily slip your foot right in. Redback Easy Escape Work Boots really live up to their name. With 2 pull tabs and elastic panels on either side, they’re easy to get off and on. This is another boot that’s great for working in a lot of environments but also has enough style to wear off the clock. The uppers are made of 3 pieces of rambler leather, which has a pebbled finish that gives them a unique and interesting look. As far as function, these boots are loaded with features. The steel toe gives you the safety you need in an intense working environment and exceeds most standards for impact and compression protection. That’s not all, the TPU outsole is oil, acid, and slip resistant and, get this, heat resistant up to 266 degrees Fahrenheit. They’re black with a contrasting grey sole. The Wolverine Floorhand Work Boots were designed especially for women. 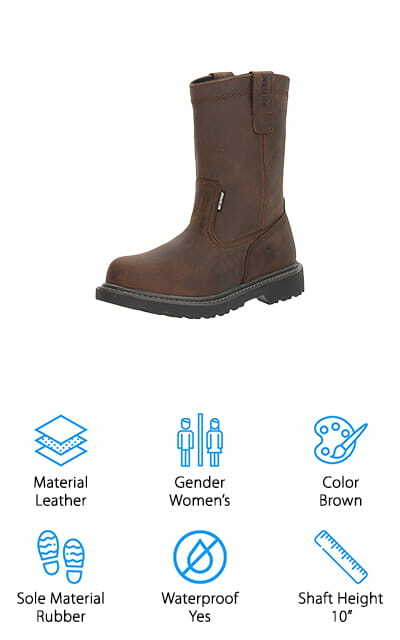 They’re 100% full-grain leather and waterproof to keep you dry in any weather or working conditions. The dark brown upper has dual side pull tabs embossed with the Wolverine name so they’re easy to get on. There’s more, the rubber sole has chunky, slip resistant tread that helps you keep your footing in slippery conditions. They’re lightweight and really comfortable to wear, even if you’re on your feet all day. The rubber midsole and full cushioned foot bed add the right amount of support to keep you comfortable without adding any weight. The foot bed is removable, too, so if you want to use a different insert, it’s really easy to do. One last thing, they have a steel toe that meets ASTM standards for added workplace safety. Last up in our work boots buying guide are these rugged ankle boots from Caterpillar. The Fragment Nano Boot is a low-cut women’s style that’s made of genuine leather. For easy on and off access, you’ll love the simple side zipper. While these boots are not steel toed, they use a special composite that protects against compression and impact without adding any noticeable weight. Get this - the composite the use is actually 40% lighter than a steel toe. That’s not all, the slip resistant outsole is also electrical hazard rated for extra safety. The inside is really comfortable, too. The comfort cushioning system has just the right amount of support and feels similar to an athletic shoe. These boots come in a wide range of sizes and are available in 3 different colors: black, sable, and tater.